Josh Patrick has several years of teaching and training experience, both in the academy and the private sector. He presented original work at the 20th Century Literature Conference in Louisville, Kentucky. Patrick worked for three years on the editorial board for "Inscape," his alma mater's literary magazine. He holds a Master of Library and Information Science. Most everyone has experienced a rash or an acne outbreak at some point. These conditions may be uncomfortable or just embarrassing, especially when the outbreak occurs on the face. Acne is one variety of rash among many. Rashes have a variety of causes and can appear at any age. In some cases, acne may be indistinguishable from rashes, so proper identification is essential in choosing a treatment course. Acne is a medical condition caused by the blockage of pores at the surface of the skin. The condition occurs most commonly in teenagers, likely as a result of increased oil production during puberty. However, people of any age group, even infants, may suffer from acne pimples. Dirt or bacteria clogging the pore results in a backup of oil. On the skin, these clogged pores may swell and trigger redness or discomfort. Deep blockages may form painful, swollen cysts that resist normal treatments. The face, neck, back and chest are the most typical regions for acne to develop. A rash on the face indicates irritation from an external or internal source. Allergies to certain plants, dyes and chemicals may cause a facial rash. Medical conditions, such as shingles or psoriasis, can also manifest as a rash on the face or elsewhere on the body. Stress, poor diet and sudden changes in climate can all make rashes worse. Contact your doctor if a rash is accompanied by pain, shortness of breath or swelling. If these symptoms develop after beginning a new medication, then a serious allergic reaction may be under way. Pain and discoloration near a tick bite indicates a possible life-threatening condition. Contact your doctor when home-care treatments prove ineffective against the rash. Preventing and treating rashes involve first identifying the cause. A doctor or dermatologist can determine whether a rash is caused by ordinary acne or some other agent. Most rashes other than acne are not limited to the face. Eczema, for example, may happen anywhere on the body and doesn't usually manifest as individual blisters. Diseases that involve facial rashes as a symptom often produce other symptoms as well. 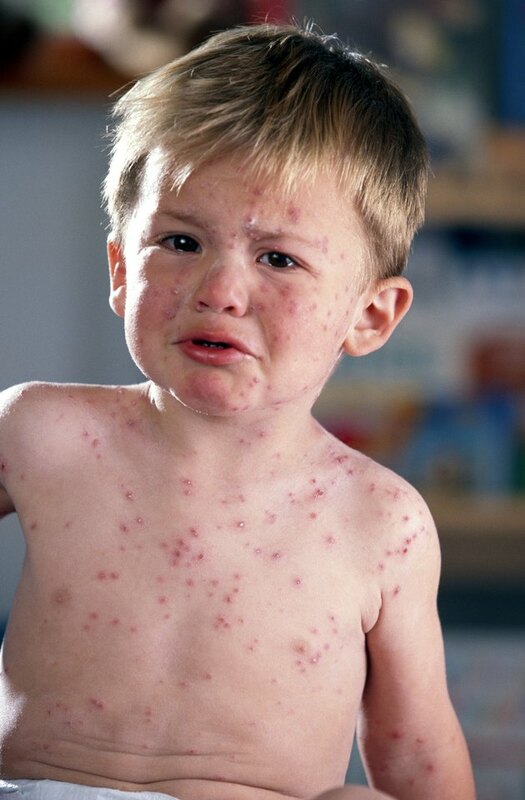 Childhood maladies like measles or chicken pox include fever in addition to the obvious rash. Allergy testing can determine when a rash is the result of an irritant like a new facial cleanser. Both acne and serious rashes may damage a person's self-esteem. Doctors realize that treating skin conditions is important for emotional well-being as much as physical health. A combination of medical treatment and lifestyle alterations is usually enough to combat a rash on the face. In the case of acne, daily face washing is important. Use a mild soap that doesn't dry the skin. Greasy lotions and cosmetics are best avoided as these irritate the skin and clog pores. Nonprescription hydrocortisone cream is effective against many kinds of nonacne rash. Persistent conditions, however, will require professional medical help.